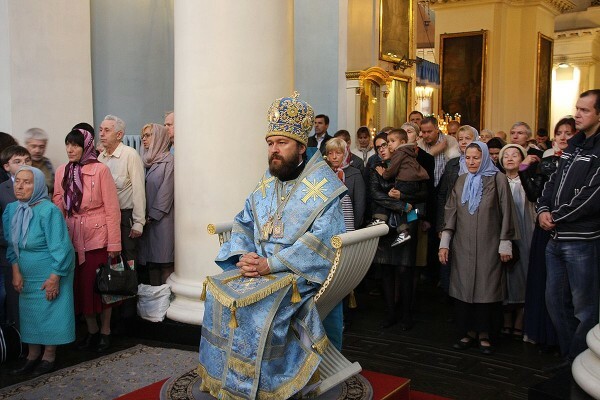 On August 31, 2014, Metropolitan Hilarion of Volokolamsk, head of the Moscow Patriarchate’s department for external church relations, celebrated the Divine Liturgy at the church of Our Lady the Joy to All the Afflicted-in-Bolshaya Ordynka in Moscow. After the Liturgy, he led the congregation in prayer for schoolchildren as school year begins on September 1. Addressing the congregation he said in particular, “In the beginning of school year we prayer to the Lord that He may give intelligence and wisdom to our children so that they may master the knowledge taught in school. We pray that they may study with interest and success. But the most important thing is that our children may preserve the Orthodox faith which we seek to hand down through their participation in the liturgy and our talks with them… It is necessary that our children always have the solid spiritual and moral fundamentals laid down by the Church. If they preserve them they will help them both in school and after school when our children will grow up and begin the world”.